The State Director-Elect works in conjunction with the State Director, during the State Director’s last term of office, in order to provide a smooth efficient transition period. Work on special assignments as directed. SHRM member in good standing required. Serves a one-year term beginning with the first day of January ending the last day of December in the last year of the State Director's term of office. John Komosa is Manager Total Rewards at Alliant Energy in Madison, Wisconsin. Alliant Energy is a Midwest energy company that provides electric and natural gas service to its customers throughout Iowa and Wisconsin. He has over twenty years of experience in Human Resources. In his current role, he oversees the planning, design, evaluation, and administration of broad-based reward programs. John is an active member in SHRM, WorldatWork, and the Greater Madison SHRM chapter, serving five years on the GMA SHRM Board of Directors. In addition, John is a board member for Gilda’s Club Madison. 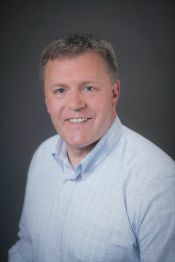 John received his Bachelor’s degree in Psychology from the University of Wisconsin - Stevens Point and his Master’s of Business Administration from the University of Wisconsin - Madison.